As I was thinking of the smartest ways to use my language arts times in this last week before testing, I decided to postpone limericks in favor of simile and metaphor poems. There is bound to be at least one question on the state tests about similes and/or metaphors. Hopefully my students will be better able to identify them now that they've had to struggle to create them. Back in February, one of Tricia's poetry stretches was to write a metaphor poem. I copied her example poem (and the revised version by Elaine) to show my students the difference between similes and metaphors. As they worked on their poems this week, I started to wonder if metaphorical thinking is right at the edge of where 4th graders' brains are developmentally. This was REALLY HARD for some of them. I also think that beginning poets probably must write a full measure of cliches and clunky metaphors before they learn to create elegant ones. xxxstomp, step, skip, jump in. and as active as an athlete. EDITED TO ADD: Check out this poem I wrote in 2011 that has a metaphor, a simile and an idiom...all in the same poem! The round up is at The Miss Rumphius Effect. It is that time of year that we are all thinking ahead to summer. Part of that is thinking ahead to our students' summer reading. This week's issue of THE BIG FRESH from Choice Literacy is on that exact theme. Lots of free resources are included in the newsletter (others are for members.) NCTE also has a link to Summer Activities as part of Read-Write-Think. This is a site and the Summer Activities link is a great one to share with parents too. I've never had the joy nor the frustration of coaxing a child into sleep. Never raised one from the ground up, as it were. I have chosen to work with 9 and 10 year olds during the daylight hours of their 4th grade year of school. I leave all the rest of the hours of every day to their parents and the rest of the years of their school lives to teachers with more patience for tots and/or teens than I have been dealt. That said, I do love to give books at baby showers that I hope are destined to become sleep time favorites -- usually Mem Fox's Time For Bed, or the old standard, Good Night Moon. In a Blue Moon is my new baby shower favorite. Slowly and gently, page by page, Mama settles Alice until it's time for the light to be shut off and the room to turn blue in the pale light of the moon. The book begins with Alice jumping on her bed and ends at a whisper with only a few words on each page. The book is what it needs to do -- soothing, quieting, calming. I daresay Mama is feeling much better by the end as well. Reviews at ShelfElf, and 7-Imp. I just got back from Washington D.C. As part of the Executive Committee, I have 4 meetings a year. This trip included meetings as well as participating in NCTE's Advocacy Day. It was a great few days. I thought you'd all be interested in the updates and info from NCTE. This is my 2nd year participating in Advocacy Day. This year, I was able to meet with a few people in my senator's offices. We had great conversations about some of the issues we are facing in literacy education. NCTE has declared April as Advocacy Month. Their website is full of lots of things that we, as teachers, can do to support what we know is right for kids. One page that I find especially helpful is this one on NCTE's position statements on certain things that Congress is dealing with. If you keep up with the NCTE Inbox Blog, there is a great post about why it is important that as teachers, we write to Congress. On another note, NCTE recently released a thoughtful statement on 21st Century Literacy--Toward a Definition of 21st-Century Literacies. Lots of people in the literacy and tech worlds have responded to the thinking, including this post by Karl Fisch. This is a focus for NCTE this year and is evident in the 2008 Conference theme: Because Shift Happens: Teaching in the Twenty-First Century as well as other events. NCTE will be sponsoring a summer institute on the topic in Indianapolis. The speakers and program look great so far! We've been paying close attention to the ways nonfiction texts are organized. Some present the information by comparing similarities, while others contrast differences. Some use a time line to lay out the facts in chronological order. Most use some form of topic (usually the title or subject matter of the book) -- subtopic (often page-by-page) -- and detail (more and more the details are found in the back of the book) structure. "Sibling relationships in the animal world" is the topic of Jenkins and Page's newest collaborative venture. The illustrations are classic Jenkins -- gorgeous and captivating cut- and torn-paper collages. Each page or spread has a sort of tab of torn paper, either at the top or bottom, on which can be found the subtopic for that page. In addition, each page has a statement, phrase, or question in large font near the illustration that summarizes the details or draws the reader into the paragraph of details about that animal's sibling relationships. For example, on the page with the New Mexico whiptail lizards, the tab is "Sisters," and the large font phrase reads, "Girls rule!" The reader is hooked into learning about an animal species that is entirely female. Only girls are born in New Mexico whiptail families, and the species reproduces without males. In the back of the book is a paragraph of general information about each animal featured in the book: its size, what it eats, and where it lives. This is a great book for any classroom or collection serving animal lovers, and an excellent mentor text for a study on the organization of nonfiction text, both for readers and for writers. The Nonfiction Monday round up is at Picture Book of the Day. I love going to professional conferences. One of my hobbies. I like the learning, the people, the books. But, I have also found that I love the jewelry! It seems that teacher conferences are a great place to find jewelry. I am not talking about teacher jewelry. I am talking about really nice jewelry by great artists. In Connecticut, I met the woman who owns Purple Umbrella. This company sells jewelry by women artists from around the world. I loved so many pieces. I bought this necklace designed by Ayala Bar(which just happened to match the jacket I was wearing at the time!). But my FAVORITE jewelry designer is Karen Spector of Karen Spector Designs. We are SOOO lucky to have her right here in Dublin. I became addicted to her jewelry years ago and have built up a nice, fun collection. 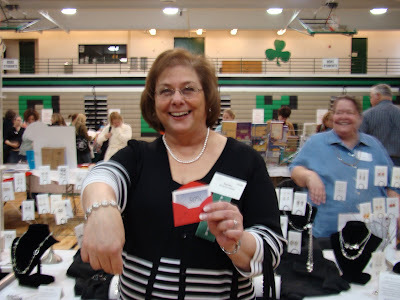 Karen Spector was at our Dublin Literacy Conference, selling her jewelry. Karen, our other friend named Karen, picked a 50% off ticket out of the basket and as you can see here, she is VERY excited about her sale item! (I am sure I will soon find out whether this Karen actually reads my blog by her reaction to this lovely photo!) That is Karen Spector, the brilliant designer, in the background. So, jewelry shopping at a teacher conference is great, but shopping just to shop is also quite fun! So, if you are local, and you have never experienced the fun jewelry of Karen Spector, you might want to put this Thursday, April 24 on your calendar and join in the fun! Seriously, if you do live local and want to see all of Karen Spector's amazing designs, think about going. If you need directions, call 766-5848. Look forward to a post about my new purchases later this week or this coming weekend! Not long ago, I was whining to my teenage daughter, "I don't know what I want to be when I grow up!" She took me by the shoulders, looked me dead in the eye, and said, "I hate to break it to you, Mom, but this is it for you. You are all grown up! You're cooked!" I jumped out of my chair. "Not so!" I shot back. "You may think I'm over but I'm not done yet! I'm still a work in progress and I'm writing my next act now." ....When she left, I wondered, "Is she right? Is this really it? Am I cooked? Am I over?" I bought the book and read it over dinner in the airport. It is a small book--a gift size book, so a very quick read. I always like these little books--the ones that come out of graduation speeches. Sometimes I am in the mood for an inspirational graduation speech--but don't have any graduations to attend. These speeches don't quite say anything new, but they remind me of things I know and often help to reground me. And the fact that Maria Shriver is a mom with brutally honest teenagers is comforting as well. 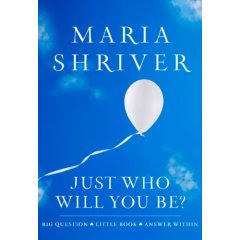 Maria Shriver, it seems, has always worked to live up to others' expectations of her--something I have been thinking about myself lately. When do we stop building our resume and start making decisions based on what others want from us. Maria hits this as well as many other little things that lots of us, as working 40+moms work through on a daily basis. And it is nice to know that we are not alone in this struggle. It is nice for someone else to remind us what it is that is important and real in life. A nice, quick read from a writer I always enjoy. These quotes are all by Moses Hadas. They and others can be found at The Quotations Page. I was a stickler about this week's poems. No off-the-cuff first drafts were accepted. Before I ever introduced the poetry form for the week, we listed a bunch of qualities we admire in people, then they picked one and did some kind of brainstorming about that quality (a web or list of words and/or phrases). Then I shared some examples from Spring: An Alphabet Acrostic by Stephen Schnur, and we studied how he makes his poems say something or show us something about the key word without ever using that word in the poem. Each other in her path. Not angry, just says what she means. You laugh when you're near him. Round up this week is at The Well-Read Child. Here's a comma, a colon, an exclamation point, another colon, and another question mark. I wonder what it takes to be a period? Or maybe I don't want to know. If, by chance, your children (or politicians) are jumping to conclusions, making assumptions, or seeking revenge before they ask for information, they you (and they) need this book. Rabbit and Squirrel live on opposite sides of the garden and yet they never speak to each other or share vegetables. One morning when Rabbit awakes to find her finest lettuce and carrots picked, she jumps to a conclusion, storms over to Squirrel's house, thumps on his door and accuses him of this crime. The next morning when Squirrel wakes up, he finds that his best tomatoes and peas are gone, he jumps to a conclusion as well, he accuses Rabbit AND he throws a rotten tomato at Rabbit's house. Their war escalates until the Gardner (the one, we assume, who was harvesting lettuce, carrots, tomatoes and peas in the first place -- we can see a large human hand through the window of Rabbit's and Squirrel's houses in the illustrations) stomps into the garden in her big green boots and chases the two pests out of garden and into the deep dark woods where they continue bickering and blaming. The book ends with the hope that they will grow tired of fighting and "learn to grow something new" -- a garden they make together. I told my students before I read this book to them that the characters remind me of "some people I know." They nodded knowingly (and sometimes guiltily) when the first assumptions and accusations were made. After I read the book, we looked for moments in the book when, if they could intervene and change the characters' behaviors, the outcome of the story could be changed. They decided that it wasn't so bad that Rabbit had made the first assumption, but if she hadn't "thumped" on the door or shouted at Squirrel -- if she had knocked and asked if he knew what had happened -- the story might have turned out differently. There's great power in a cautionary tale such as this one. It gives our children a way to distance themselves from their disagreements and think about the problem in terms of Rabbits and Squirrels. Hopefully the big people who read this book -- the "gardeners" who ultimately "own" the "garden" -- will look for their message as well. Is it really necessary to chase the problems away with a pitchfork, or is there some way we can all share the garden with less war and enough peas for everyone? Another review with great pics is over at 7-Imp. 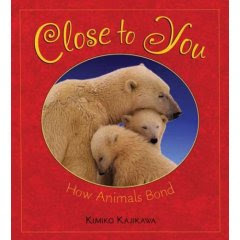 My new favorite nonfiction book for young children is CLOSE TO YOU: HOW ANIMALS BOND by Kimiko Kajikawa. I love great nonfiction books with predictable text. This new book is a great one for new readers. Each page follows a pattern about an animal and its baby. "Polar Bears cuddle in a den of snow." and "Ducklings line up in a single row." There are photos to accompany each animal's fact. This is also a great book for older readers because of the huge amount of info at the end of the book. One two page spread goes on to explain each of the photos that is in the book. Another addition at the end of the book is a chart with lots of animal info (number of babies, weight at birth, weight at maturity, age of Independence). A great book --especially for young readers! This week they tried haiku. All of the poems in this week's post were written by my fourth graders. The next few were inspired by these photos I called "Faces in the Trees:"
These were inspired by a set of photos I called "Buds and Blooms:"
The garden has some flowers. Let's give them to mom! This week's round up is at a wrung sponge. You might pass this book up if you're not careful. The illustrations don't look very sophisticated and you might think the book will be a preachy diatribe about using correct punctuation. Give it a chance. You'll be pleasantly surprised. Meet friends Penny the period who is on safety patrol (she's good at stopping), Connie the comma, and Quentin the question. The three sign up for the Punctuation Bee in Mr. Dash's room. Elsie, the bouncy enthusiastic cheerleader (an exclamation point) also signs up, and the three friends get busy practicing for the bee so they can beat Elsie. Each Punctuation Bee participant is given a word that he/she must use in a sentence that is correctly punctuated with his/her punctuation mark. The competition is close -- it's won on a technicality -- and you're going to have to read the book to find out who wins! Read carefully so that you don't miss any of the puns: the hyphen that dashes by, the asterisk named Stella, and more. Donohue is smart: she doesn't overdo the characterization of the marks by trying to be clever with them all. She focuses on the period, comma, question mark and exclamation point. That means her story doesn't get away from her (or from the reader). And the illustrations? They grow on you. Give this book a chance. I'm betting you wind up adding it to your collection. The March-April issue of The Edge of the Forest is up at Big A little a. Lots of great articles and features for your perusal. Get thee over there and peruse! 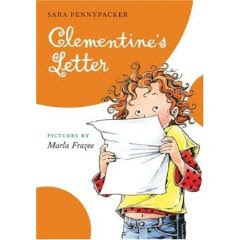 I just finished CLEMENTINE'S LETTER by Sara Pennypacker. I picked it up Tuesday--on the day it came out. I must say, driving to the bookstore felt a bit like driving to the airport to pick up an old friend who was coming into town for a visit. I was thrilled that Clementine was back! I must say that I was a little worried at first--how could I possibly love this 3rd book about Clementine as much as I had loved the first two? I figured it was really nearly impossible. The GOOD NEWS is that I did! I just now closed the cover and must say that this may be my very favorite Clementine book. I loved, loved, loved it. Clementine is as lovable and clever as ever and the story was as good as ever. Bill at Literate Lives listed his 10 Reasons for Loving Clementine. I agree with each and every one of them! And I think I could probably add 10 more. Maybe 100. One of my favorite thing about Clementine is the way that she understands school and teachers. In my review of THE TALENTED CLEMENTINE, I reviewed all of the very smart things she said about teachers. Quite the insightful girl! But in this book, we see that Clementine really does have school and teachers figured out. She is an independent girl who needs things to make sense. And she has lots of strategies for doing this. This book is a refreshing read during testing time. Sara Pennypacker understands the things that make a good school and a good classroom. Her adult characters are all respectful of children. And, school in her books, is the happy place that it should be. She somehow creates characters like Mrs. Rice (the principal) who is a bit stern, but clearly cares for Clementine. She creates characters like Mrs. Nagel who learns from Clementine. And she creates Mr. D'Matz who understands Clementine. The relationships that Clementine has with the adults in her school are so fun to read about. The teachers in the book focus on what is important--the kids. I must say that I have not given Marla Frazee enough credit for Clementine. But, I can't imagine that this author/illustrator combo could be any more perfect in their creation of this character. The illustrations are so critical to getting to know Clementine. And, I must say, my very favorite page in the book may be the very last illustration, following the end of the text. The picture of Clementine is precious. I don't need to talk about plot here because the plot is always secondary to the characters-even though the plot is quite good. What makes these books amazing is the characters that we have come to love in such a short time. So, the BAD NEWS--there is no sign of a 4th Clementine book anytime soon. If anyone has news on when the next one will be out, please share! I think it is time for dolls, t-shirts, and coffee mugs.....Clementine is definitely a character that will be around forever. Write faster, Sarah! 1. Tracking the word KIDLITOSPHERE -- authentic word study. 2. Mom's Overture (Teachers' Overture, too) because they make her laugh every time. 3. Interview with Peggy Gifford, author of Moxy Maxwell Does Not Love Stuart Little. 4. Teachers According to Clementine. 5. Our first birthday post. 1. One of the best book reviews I've ever written. It was easy. It was a great book. 2. One of my favorite Poetry Friday posts. 3. Our Robert's Snow illustrator features, Matt Phelan and Jeff Newman. 4. My review of Animal, Vegetable, Miracle. Summer reading really will come back, won't it? 5. The post in which we highlight a great new blog -- Two Writing Teachers! Becky at Becky's Book Reviews is playing. Go check out her retrospective! Here are two of my new favorite poetry books. They are also two of my new favorite nonfiction books! Kids love the Guinness Book of World Records. In The World's Greatest: Poems, J. Patrick Lewis has picked 25 world records as the topics of poems as widely varied as the styles of the poems: from the dumbest dinosaur to the most live scorpions eaten by a human, and from acrostics to limericks (aptly enough, the limerick is for the poem about the biggest potato). I dedicate the poem "The Most Plates Spinning" (Dave Spathaky, London, England, 108 plates, November 23, 1992) to kindergarten and first grade teachers everywhere. Monumental Verses is a trip around the world to see (in gorgeous, full-color, National Geographic photographs) thirteen of the world's greatest human-made landmarks. They are as ancient as Stonehenge and Easter Island and Machu Picchu, and as modern as the Golden Gate Bridge and the Empire State Building. Again, J. Patrick Lewis treats the reader to a variety of poetic forms including three that match the monument -- a large T-shaped slab of prose poetry for Stonehenge, a pyramid of poetry for The Great Pyramid of Cheops, and a twisting S of poetry for the Great Wall of China. The official J. Patrick Lewis website. World's Greatest: Poems reviewed at 7-Imp. Integrating science and social studies with J. Patrick Lewis' A World of Wonders: Geographic Travels in Verse and Rhyme at Miss Rumphius. Elaine's Wild Rose Reader interview with J. Patrick Lewis. 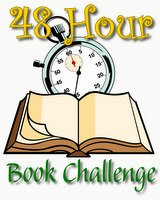 Today, Mother Reader announced her 3rd Annual 48 HOUR BOOK CHALLENGE! This is the idea that totally hooked me on Mother Reader's blog 2 years ago. It was clear from this idea that the woman is brilliant! Each year, Mother Reader invites us all to her 48 Hour Book Challenge--a weekend that we devote to reading...just reading. Reading the whole weekend. Making reading the main thing that we do. See how brilliant she is? This year, it just so happens that the annual fun begins on our very first day of summer vacation. What perfect timing! Now, I have never been able to participate in the fun of this challenge. I have always had some prior commitment. Right now, I have this exciting event marked on my calendar. I am hoping that I can participate. I will start my stack soon--imagine what I can get read in 48 hours! And, like I told Mother Reader, even if I don't participate, this challenge makes me happy just thinking about it. Thinking about having 48 uninterrupted hours to read is such a great thing. I think we should make this an official holiday--this 48 Hour Challenge started by the brilliant Mother Reader. Each week during the month of April, we are going to study a different short form of poetry in my class. This first week, inspired by Laura Salas' weekly challenge, my students wrote 15 Words or Less poems. Armed with the power of iPhoto and flat screen TV that I can connect to my teacher computer, I shared a different image each day for their inspiration. Not surprisingly, yesterday's photo really got the creative juices flowing. but I know it's a big disguise. to the pumpkin picture beside the flag. Next week instead of counting words, we'll be counting syllables with haiku. After that, we'll try acrostics, and finish up with limericks. The roundup this week is at Becky's Book Reviews. As you know, I am not much of a graphic novel reader. You are probably shocked that I am actually reviewing a graphic novel since Mary Lee is the blog expert on these! But I am trying. I have my favorites--To Dance, Babymouse, Jellaby. 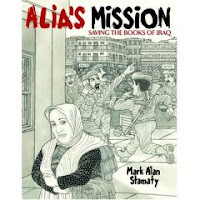 I just received a copy of ALIA'S MISSION by Mark Alan Stamaty and will add it to the list of graphic novels I am glad I read. It is the story of the library who saved the books of Basra. I have read the story before but I must say that the graphic novel form fits the story well. It is definitely a story that is better told with graphics and art together with text. The black and white illustrations add to the tone of the book and the history. The graphic novel tells the heroic story and the graphics do a great job of showing the emotions that went along with getting the books out of the library. It is a very powerful book and I am starting to see myself as a reader of graphic novels. I am becoming more and more interested in this genre. (Mary Lee has helped me along with that.) As a teacher, I want my students to understand that graphic novels are more than Superheroes. I think that is why I am always so intrigued by these books on true and serious topics. I think graphic novels provide a great "in" for kids who are reluctant readers. For years, all these kids had when choosing this format were comic books about superheroes or cartoon characters. Now, graphic readers can read a variety of genres and topics--and the number of these books for younger children are growing. That is all good news! This is definitely one I'll add to my 3rd/4th classroom library. The topic of war is a hard one but it is well done. It probably isn't appropriate below 3rd grade and I can certainly see it being read through middle or high school. A great addition to any collection. Yesterday I asked my students, "What are you doing in writing workshop that you'll be able to transfer to the writing portion of the achievement tests?" 1. The ability to focus and WORK. 4. Stick to a project. 6. Use short and long sentences. 8. Stick to the plan. *This speaks to their ability to judge the writing task and plan accordingly. **We laughed about this one. It is obviously about engaging your reader, but they understand that even if they don't care about the topic (ie: achievement test prompt) they still must engage their reader! ***Okay, okay. I added these two. My point was, if you know how to "stick to the plan," that means you know it's important to PLAN! Likewise for editing. What are you doing in the course of your regular instruction that your students will be able to transfer to their achievement tests? I have a group of kids in my class this year who LOVE novels in verse. They love Heartbeat by Sharon Creech, Where I Live by Eileen Spinelli and Becoming Joe DiMaggio by Maria Testa. As a teacher, I am finding that these are great books for readers of this age (and beyond). These novels tend to have a lot of depth. Some of my students who have difficulty sticking with books until the end, have the stamina to finish a novel in verse. I am not sure if they like the fact that they feel like they are turning pages quickly or that each page is shorter than a typical novel. But, they are reading some great books in this genre and they are really changing the ways they think about what they read because of it. So, I am currently on the lookout for books like this to add to my collection. Sometimes the books are a bit too sophisticated for 3rd and 4t graders. 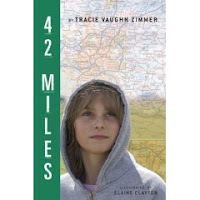 This week, I read 42 MILES by Tracie Vaughn Zimmer. (She is an Ohio author which adds to the fun of finding a new book that I love!). The book is about JoEllen. JoEllen splits her time between her mother's home in the city and her father's home in the country. The book is told in first person so we get into the thinking of JoEllen and how she feels about having these two quite separate lives. The book (and JoEllen) deal with issues common to so many kids--divorce, friendship, bullies, rules, teachers and more). Many of the poems in the book can stand alone as powerful poetry. Many can be used as mentors for student writing. But the way the poems work together gives us a story about a girl and family that is a good one. Illustrations, photos, maps, etc. add to each page so there are visuals throughout. This book packs a lot in with just 73 pages. I am excited to add this book to my collection. I am sure it will make its rounds in my classroom this week. The authors took an inquiry stance to test taking and found effective ways to help their students think through the test genre. The authors are a group of teachers connected with the PEBC--the group that has done so much amazing research about the comprehension strategies. In this book, they have taken what they know about those same strategies and have worked with students to help them make sense of the test. They begin the book by sharing their own experience--thinking through their own behaviors as test takers. Then they take you into classrooms to show how their own understanding helped them think through testing with their students, by looking at it as a specific genre. There are not many books about testing that stay true to our beliefs about teaching. But PUT THINKING TO THE TEST does! For teachers who are committed to reading/writing workshops, for teachers who value the power of inquiry, this book is perfect for helping kids work through test taking skills in ways that are authentic and effective. I started reading at the beginning. If you read the book online, I suggest doing the same. 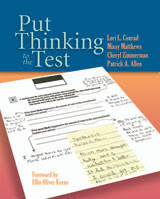 The first chapter explains the process that the authors went through in their own thinking about the genre of tests. Then, I read Chapter 2: Tests as A Genre. This chapter leads us through the introductory pieces of this unit in a classroom-helping kids notice things and learn about the test genre. I figure I will begin there this week and read as I teach. And hopefully, I will have my own copy of the book by the time that I get through a week or so of test prep stuff. This book is one of the best I have seen on the topic recently. It is up to date in terms of the issues we are facing as teachers. And it takes the research that we know well--comprehension research--and uses it to help students make sense of test-taking. In a workshop classroom, this book makes sense. And the timing is perfect! I just popped into Cover to Cover to pick up the new Pigeon book and the new Clementine book (more on those later.) 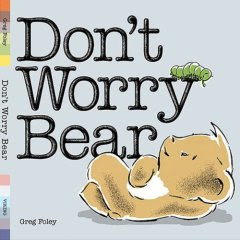 But I got another nice surprise when Beth showed me this new book, DON'T WORRY BEAR by Greg Foley. This is one of the sweetest picture books I have seen in a while. And the text is predictable with great picture support so it is a great one to for new readers. Bear and Caterpillar become friends. But caterpillar is busy making a cocoon. He tells Bear, "I'll stay inside for a while. But I promise you'll see me again." Bear visits the cocoon and worries about his new friend. Each page follows the same pattern (He came when it rained. Caterpillar said, "Don't worry, Bear. I'm not getting wet." Bear tries not to worry but then worries more when he finds the cocoon empty. A happy ending follows! This bear is so darn sweet. You can't help but love him. And the story is just as sweet. I am not usually into sweet, but I love this new book. I bought it because it has great supports for new readers. And because I just loved it! 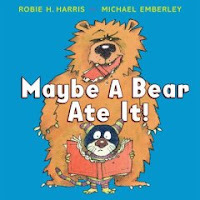 MAYBE A BEAR ATE IT by Robie Harris and Michael Emberley is a great new picture book that I couldn't resist. First of all, it is a story about reading. About what happens when you lose your favorite book. About how desperate you become when you lose your favorite book! In this story, the main character loses his/her favorite book and thinks about all of the places it could be. The text has lots of predictability because much of the book follows the pattern of "Maybe a Rhino ran away with it." So, this is a great book for early readers. It has great picture support, large text with good predictability and pattern. And, of course, there is a happy ending!